Prime Minister Ranil Wickremesinghe says that a decision was reached that the citizens of Sri Lanka should be involved in the country’s economy and decision making process by implementing a transparent tax scheme instead of a hidden tax agenda. The PM met with the Ministers, Members of Parliament and Electoral Organizers at Temple Trees in Colombo last evening. During this meeting, we analyzed the future of Sri Lanka’s economy, and the reasons behind the Nation’s dire economic situation, he said. 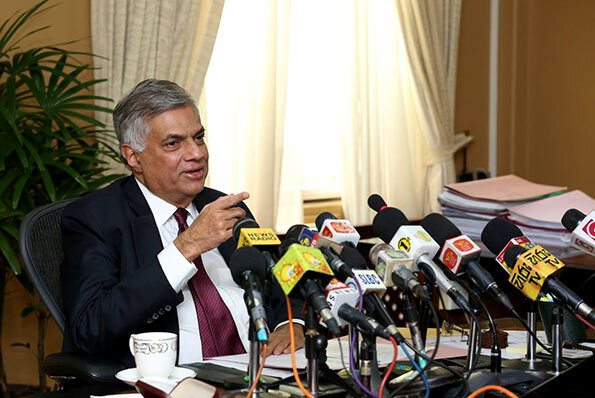 “It was explained that going forward, difficult decisions would have to be made in order to avert a complete breakdown of the economy,” Wickremesinghe wrote on his official Facebook account. He revealed that the necessity of devising a simple tax scheme, as well as creating a transparent environment for the payment of taxes through a systemic arrangement was also deliberated. “We took over a nation with a pillaged economy in its wake.” And it was declared that the full support of all citizens of Sri Lanka would be required in order to bring back a sustainable and flourishing economy to the Island, he said. Yes Mr. PM, everything is transparent. Introducing VAT increase without a proper awareness and debating in the parliament, arranging to sign the controversial ETCA with big bro India, appointing of the new governor, these are all done/doing in a democratic transparent manner. This is like changing pillows to cure a headache .